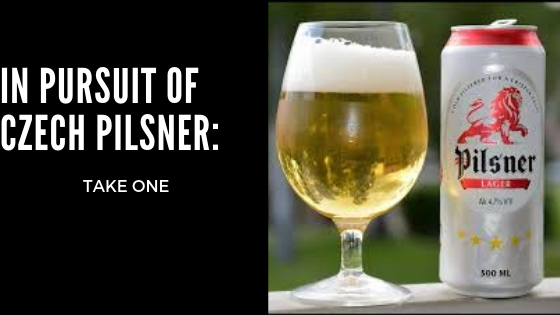 You may remember me talking about a friend of mine in the Czech Republic who is ranting and raving about their Pilsners, and that I took said ranting and raving as a challenge. Now, Bohemian Pilsner is not a style that I have a lot of experience with, which includes drinking them. I’m a dark-beer kind of guy, and so a Pilsner on tap isn’t too exciting for me. I gotta say, researching and brewing this beer has given me a new appreciation for this style, it really is a work of art. Simple complexity, difficult to achieve. Not that I did, but I am pretty happy with the first attempt, and I think I have some solid foundations to move forward with. In this post, I’m going to be talking about the differences between two types of yeast, and I still need to send these bottles out to some friends who are going to chip in with their feedback and what they think the differences are. So, I will be using the labels 1, 2, and 3 to refer to the beers here, and the ones being sent out were randomly given the letters A, B, and C. The letters were assigned by a friend, so I have no idea which beer is which letter. While I was working on this recipe, there was quite a bit of debate about the base malt. My original intention behind using it was because of the idea that it was less-modified than standard base malts, and would be better to use in a decoction mash. Turns out, this is a bit debated as to whether or not this is the case, but either way it turned out to be an excellent base malt so I’m going to stick with it. The carapils was for head retention, and honestly this area was a bit lacking, which could be due to my glassware but I also think is a consequence of my inexperienced decoction mashing skills, so the proteins that benefit head retention didn’t make the cut. I’ll probably increase this to 5% in the next batch. Finally, I used 2% acid malt, but really this is negligible and unnecessary. I also don’t have a pH meter, so I have no way of knowing if this helped. In the future, I’m going to get rid of the acid malt, get a pH meter, and probably either use lactic acid or do an acid rest. The hops turned out really well, but I think next time I’m going to use an even bigger flameout, and maybe even wait until the wort has cooled to 180°F-ish to add more. The aroma was nice, but not as spicy as I wanted it and so that is something to work on in the future. May even dry-hop. We will get to the yeasts in a bit, but of course I used a starter for the yeasts, considering this needs to be lagered. I landed on doing a single decoction mash, since I wasn’t totally sold on the idea of decoction, but since a Bohemian Pilsner essentially screams for that sort of mash I decided to go with it. Plus, there are a lot of sources that advocate for a decoration mash, albeit from anecdotal experience. So since I wasn’t sold, and the LHBS owner wasn’t convinced that a decoction beyond the first one would be useful, I went with a single decoction instead of the planned triple. I ended up following this schedule from HomeBrewTalk. My plan was a protein rest at 126°F for 20 minutes, a sacc. rest at 151°F for 60 minutes, and then mash out at 168°F. So, heat the water. I always heat about 10°F-20°F hotter than I need to prime the mash tun, then just wait for the water to be strike temp. The water I ended up using, after a lot of deliberation, was a 6:1 ratio of Reverse Osmosis water to Tap water. My tap water is moderately hard, so really I just wanted some of the minerals for the mash. Next time, I’m going to build a more exact profile, but this was about as soft water as I’m going to get without being totally composed of RO water. Rest assured, it was soft water. Everything was going surprisingly well at this point, but of course, that’s when the problems start. My decoction ended up not being hot enough, and only brought me to 144°F. I didn’t want to heat more water and add it to the mash, and so I improvised by doing another decoction. The second decoction ended up bringing me to 152°F, which was fine for the time being. Something to take away from this is to really heat your decoction and probably pull a bit more than you think you need to. You can always wait for the decoction to cool down before adding the rest. So now that the mash is all finished, I added the Saaz to the kettle and started draining the mash-tun. After the 90 minute boil, I ended up with exactly the volume I wanted, 4 gallons. Let’s call the Urquell Yeast “1” and the Bohemian Yeast “2”. Pitched at 46°F and let it free rise to 48°F, where it fermented for five days. Removed the probe from the side of the fermenter and let the ambient temp free rise by 3°F, which I repeated every twelve hours until I was at 65°F. Let it ferment and clean-up at 65°F for 3 days. Ramped down the temperature to 34°F. This is the only point at which I separated from the quick lager method. I’m of the opinion that the slow ramp down doesn’t matter so much. Let it sit at this temperature for about two weeks, longer than I had anticipated but I wasn’t too concerned. The beers ended up having the exact same Final Gravity, 1.012, which is .001 lower than my expected FG. So, I’d say the yeast nailed it. Now, pretty late in the game, someone asked if I was blending the beers at all. I wish I had thought of this sooner so I could do a blended yeast, rather than just blending the finished product, but I did end up making a gallon of batch “3”, which is a blended batch. The bottles were conditioned at around 70°F-78°F for about two weeks, and then they sat in the fridge for another two weeks. So a total of a month of conditioning. Next time, I’d like to get a 3-gallon keg and see if I can store it in a friend’s kegerator, because a few reliable brewing friends recommended drinking the beer fresh, so I’d like to try that in the future. I also went to the store and grabbed some Pilsner Urquell, my friend’s favorite beer from the Czech Republic, and the originalpilsner that we discussed in the planning post. You know, for comparison. The Pilsner Urquell, note the clarity and that golden color. It has a wonderful malty sweetness in the aroma that I’d imagine is tough to replicate, but there aren’t many spicy notes from the hops which disappointed me a little, I had hoped for them to be a bit stronger. Very clean though, nice sweetness. Taste was excellent, a great beer. The carbonation was perfect, very clean, some smooth bitterness from the hops and a wonderful malt-backbone to hold the whole thing up. Honestly not as complex as I had thought it would be, but still a great beer. Not excellent or something to rave about, but great. Honestly, brewing a beer like this would feel like an achievement. Beer 1, the batch fermented with WYeast 2001 Urquell Lager Yeast. The aroma was a bit spicy, spicier than the Pilsner Urquell, which was fantastic, absolutely what I wanted. I think it could stand to be a bit spicier. There wasn’t much in terms of the malt aroma though. 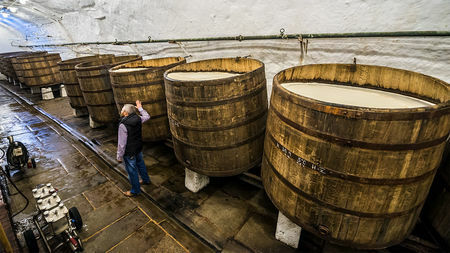 It was certainly present, but lack the complexity that the aroma from the Pilsner Urquell had. The flavor was also lackluster. The malt profile was simple, present, and lacking in complexity. As you can see, the color was nice but medium-cloudy which is far from what I want. The hops were not too present, but they were noticeable. It was a very “eh” beer. If this was the only result of the work, I would start from scratch next time. Beer 2, fermented with WYeast 2124 Bohemian Lager Yeast, was the superior of the two beers, by far. First off, right off the bat, head retention was better, carbonation was better. This is my error, had to have been a problem with priming sugar, though I swear I was consistent. The color was a nice, straw-color, almost gold, not as brilliant as the Pilsner Urquell but certainly on the right track. It was also fairly clear, and with some work (or gelatin) I feel like it could be crystal clear. Aroma was sweeter than that of Beer One, and it was even a bit more complex, really happy with the aroma. The flavor was clean, complex, and balanced. It was a big step forward. Again, nothing incredible, but I actually feel like I have something to work with here. A good beer, something I’d share with friends for sure. Finally, we come to Beer 3 which is the blended beer, post-fermentation. It is exactly what you’d think it would be, a step up from Beer 1 and a step down from Beer 2. We will see what others think when I send them out and hear back, but I really wish I had blended the yeast and fermented a third batch, rather than blending post-production. So, in my book, the clear victor is Bohemian Lager Yeast. When I try this again, I will be doing some more research into decoction, and possibly looking into melanoidin malt as an alternative to decoction. Either way, I’m really happy with how Beer 2 turned out and I can’t wait to really get this style down! Have a great pilsner? Have tips and tricks? I’d love to hear them!